Send a 6 inch bhai dooj thali with 400 grams haldiram kaju burfi, 250 grams haldiram soan papadi and 1 haldiram namkeen 200 grams. 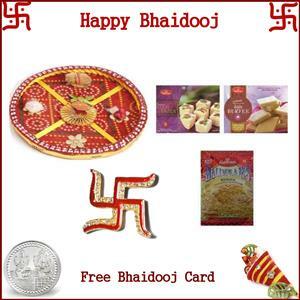 this product comes with a free bhai dooj decorative and a free silver plated coin (5 gram size), roli tikka and a handmade paper bhai dooj card.. delivery only in usa. please place your final order by october 21st, 9 am, us central time for assured delivery on october 25th, 2014.